Okay, step up, people! Those tomatoes aren’t going to throw themselves! It’s The Brady Bunch from the groovin’ 70s, transplanted into the grungy 90s. Plot lost. Actors shamed. Comedy dead. The Brady’s owe back taxes. They must pay $20,000 or they lose their house. It’s up to the kids to raise that money – by winning a singing competition. So let’s get this straight: the parents of the house are derelict in their homeowner duties, yet dad keeps assuring mom that “Everything will be alright.” Yet everything is NOT alright if the money that eventually saved their house was won by their kids, who happened to see an ad for a talent contest, happened to be singers, and happened to face no better “talent” (at least, by the judges’ standards) in the contest. Did I get that right? And then people wonder why so much vomit was choking the aisles at screenings of THE BRADY BUNCH MOVIE. Gary Cole stars as patriarch Mike Brady (originally played by the unflappable Robert Reed), the filmmakers opting to go with Reed’s cheesiest hairdo from that era – the Perm To Die For. 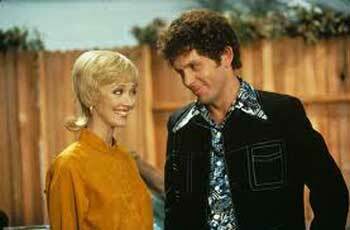 Shelley Long is perfection as Carol Brady (originally Florence Henderson), looking and sounding exactly like Henderson in her Helmet And Fishtail ‘do. The Brady Kids are all vapid representations of their ‘70’s counterparts, except for – Marcia Marcia Marcia! Christine Taylor positively inhabits Maureen McCormick’s most famous role – that of teen boys’ wanking fantasy, Marcia Brady. No matter what roles Taylor may play in the future (DODGEBALL, ZOOLANDER), we will always see through the makeup to the Marcia Marcia Marcia beneath. Michael McKean is next-door neighbor Larry Dittmeyer, who has a stake in Mike selling his house; a welcome cynical presence around the syrup of Cindy Brady and her oblivious clan. TV director Betty Thomas, and writers Laurice Elehwany, Rick Copp, Bonnie Turner and Terry Turner do a strange thing with this remake of the 1970’s television sitcom that we all grew up with. They have no intention of endearing the Bradys to modern kids, nor is this version empowered to instill life lessons through the antics of the Brady brood; no, the filmmakers purposefully play it as if this is the Brady family from the early ‘70s sitcom (replete with fashion emergencies, outdated cultural norms and uncool vernacular from the 70’s) transplanted into a modern setting. As if they’ve just arrived in the 90s in a time machine. Thus, the only people who get the fish-out-of-water gags are people who knew the original cheesy show. It’s a kids’ show of the 70s, aimed at adults of the 90s. It’s completely NOT what THE BRADY BUNCH was made for, or stood for, or mocked for. Supposedly a fish out of water tale – but these fish have never been out of the water. Meaning: how can these Bradys retain their ignorance of the modern world while living in it? They are all constantly bombarded with media, they attend school, Mike goes to his job, Alice goes shopping, Carol watches TV, reads magazines – they are all out in the world and interacting with it constantly. Where is the disconnect that allows them to be such cultural nitwits? It’s kinda stupid and embarrassing all at once. A running gag is architect Mike only designing buildings that look like his suburban home (whether they be laundromats, burger joints or banks). How is he still employed? And how are the kids still using terms like “far out chick,” and “he’s so outa sight” when they are too young to have known those terms? You pick up slang from your peers, especially in school. But in school, there’s a Pearl Jam ethos sweeping the nation. (Real Greg Brady Record Exec even says to New Greg Hipster Tool, “Today’s sound is grunge, Seattle!”) So are the Brady kids picking up their outdated slang from reading Jimi Hendrix interviews? The cold open shows a fast-paced, grimy world of modernity. Then the opening titles, done in the same manner as the TV series: nine boxes, smiley faces, insufferable jingle – but with a new rock beat that is far out, man! The movie has a TV feel, due to using the same interior design of the house, and the original series’ bumper music and situational music. And they start in on the classic lines from the series almost immediately. The Bradys’ yard is a hermetically sealed environment. As soon as Cindy chases a ball out of the back gate, the clamor and grit of the 90s descends upon her. But she doesn’t feel it. Her psyche is as hermetically sealed as their yard. There are a lot of premises from the original sitcom crammed into this movie, but none of them are resolved – they are just for nostalgia value, and mean next to nothing in the context of the movie, but to older viewers they will raise a titter or two. And Alice is as annoying as ever. Full marks to the actors who are willing to make complete asshats of themselves in this mildly funny – satire? spoof? travesty? I was embarrassed FOR them, watching them doing such a good job of being embarrassing. Queasy, shameful emotions course through your body, chasing others of their kin through the viscous, unctuous cockles of your breast. At times you snigger with a knowing nod to the callback gags, but most of the movie, your skin will crawl with trepidation. Especially during the “talent show” where the Brady kids do the same song they did from one of their TV shows. Keep On, complete with the choreography. The most amazing part of this performance is that all the way through it, you just want to beat them with your shoe. Davy Jones cameos, as he did on the TV series, when everyone was younger and actually cooler – here, he fronts a grunge band singing The Monkees’ Girl. Two more Monkees, Peter Tork and Mickey Dolenz, cameo as judges of the talent show – which explains why the Bradys won (at least to the over-30s who get the gag). But doesn’t explain how they sang to backing tracks that faded out along with their vocals and still won. Writers: Sherwood Schwartz, Laurice Elehwany, Rick Copp, Bonnie Turner, Terry Turner. Starring: Shelley Long, Gary Cole, Christine Taylor, Christopher Daniel Barnes, Jennifer Elise Cox, Paul Sutera, Olivia Hack, Jesse Lee Soffer, Henriette Mantel, David Graf, Florence Henderson, Jack Noseworthy, Jean Smart, Michael McKean, Moriah ‘Shining Dove’ Snyder, Keone Young, James Avery, David Proval, Barry Williams, RuPaul, Ann B. Davis, Davy Jones, Micky Dolenz, Peter Tork, Christopher Knight. A telling sign of the times: in the early 70s, the Brady Kids competed for a $100 prize; in 1995, the prize is $20,000. Another telling sign of the times: the embarrassment level is still sky-high in the modern version, and the technical aspects of the performance are as low as they were back then.